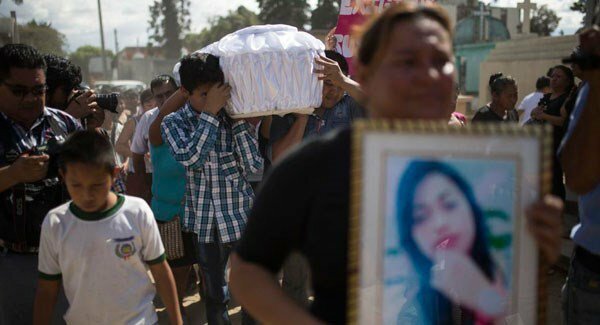 Families have buried some of the 38 girls killed in a fire at an overcrowded government-run youth shelter in Guatemala as authorities try to determine exactly what happened. The death toll mounted as girls succumbed to burns from Wednesday’s disaster, which officials said began when mattresses were set on fire during a protest by the shelter’s residents. Questions remained over why someone among the girls set the blaze and whether doors remained locked as the girls pleaded for their lives. Parents and relatives said many of the young people at the shelter, which had both female and male residents, had been sent there because of abuse, poverty or family problems. Others were ordered there by judges after run-ins with police, officials said. Authorities at the Roosevelt Hospital where many of the girls were taken for treatment of their burns said on Saturday that another girl had died, taking the death toll to 38. Nineteen of the girls died at the scene and another 19 died later in local hospitals. Various groups have said they plan to gather on Saturday to protest the deaths and demand the resignation of Guatemalan President Jimmy Morales. The president has blamed the government’s “rigid” and “insensitive” system for dealing with troubled youths and has promised to reform protective services for some 1,500 minors currently living in youth shelters around the country. Carlos Soto, administrator of Hospital San Juan de Dios, another hospital caring for many of the burned children, said medical specialists had arrived from Galveston, Texas, to help evaluate the condition of several with the intention of having them travel to the United States for treatment. Mr Soto said that it was hoped that at least four of the girls could travel to the US this weekend. He said the girls had burns on their faces, torsos and legs.